Cover the third grade curriculum with this Summer School packet! Over 200 pages of Reading, Writing, and Math. 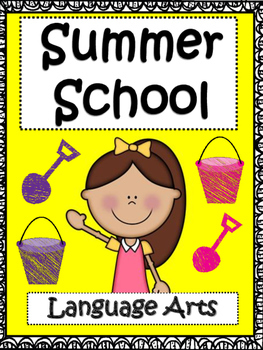 This packet will take you through your entire Summer School session focusing on language arts. 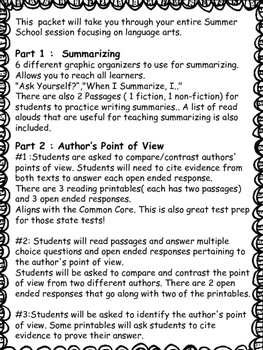 Part 1 : Summarizing 6 different graphic organizers to use for summarizing. Allows you to reach all learners. "Ask Yourself?“,"When I Summarize, I.."There are also 2 Passages ( 1 fiction, 1 non-fiction) for students to practice writing summaries.. A list of read alouds that are useful for teaching summarizing is also included. #1 :Students are asked to compare/contrast authors' points of view. Students will need to cite evidence from both texts to answer each open ended response. There are 3 reading printables( each has two passages) and 3 open ended responses.Aligns with the Common Core. This is also great test prep for those state tests! #2: Students will read passages and answer multiple choice questions and open ended responses pertaining to the author's point of view.Students will be asked to compare and contrast the point of view from two different authors. There are 2 open ended responses that go along with two of the printables. #3:Students will be asked to identify the author's point of view. 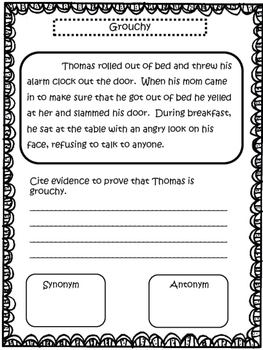 Some printables will ask students to cite evidence to prove their answer. 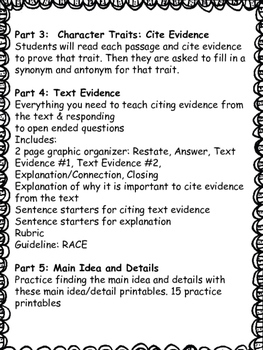 Part 3: Character Traits: Cite EvidenceStudents will read each passage and cite evidence to prove that trait. Then they are asked to fill in a synonym and antonym for that trait.